You’ll enjoy quicker and more accurate quote preparation which can enable more sales and higher margins. 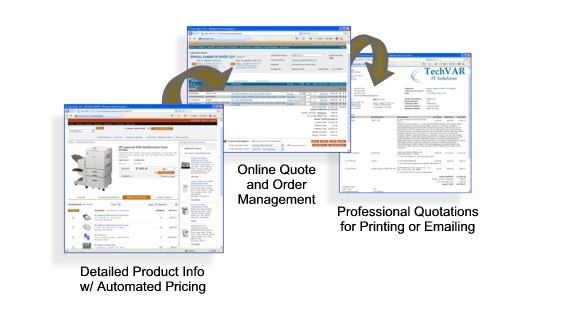 With features designed to simplify the entire quote to order process, our solution can make your entire organization more efficient and productive. As an integral part of the sales process, ProSel Commerce provides your sales team with new capabilities making quoting faster, easier, and more convenient for them and their customers too! And, it’s fully integrated with client-side e-commerce, simplifying learning and system management. Automated, client-specific pricing, multi-vendor sourcing, real time price and availability and integrated, rich product content combined with online account management, makes this the complete quote/order management system for your sales team. Pricing your products and services correctly is key to achieving higher margins and ongoing profitability. To stay on top of the thousands of product introductions and price changes that can occur within an industry, and to provide just the right pricing for your customers, ProSel Commerce incorporates multiple methods to automate the pricing process. With built-in automation for key distributor sources and able to automate price file imports from almost any source, ProSel Commerce keeps your product and pricing database up-to-date via automated nightly downloads. Flexible user-group based supplier filtering lets you control which product sources are available to which clients/users, providing the ultimate in product sourcing/pricing control. Where multiple product sources carry the same item, your suppliers can be ranked for priority allowing you to steer business to your preferred business partner. ProSel Commerce can be set to automatically recommend your lowest cost supplier for any item, based upon availability rules you control. Create any number of account profiles to determine the product mix and pricing applied to a specific client or group of customers. Account profiles are dynamically applied so that a change in the item’s cost can immediately trigger a new selling price. Sales team members have full control to override automated pricing on an item by item basis. Administrator access provides complete pricing database control. Built-in ‘real time’ access to top-tier distributor sources means your sales team can instantly access multiple suppliers price and availability right from the product search results or quote screen. Save time and earn better margins while eliminating the need to access multiple distributor websites. Real time access automatically updates your local ProSel /IT database to keep your system current throughout the day. Access client transaction history for determining product pricing history. Besides increasing individual sales productivity, our web-based access encourages sales team and customer collaboration, and helps sales management stay abreast of business. Online access to all transactions, order history and real-time sales reporting makes it easy to manage your business like never before.